On paper, a tour where Young Fathers and Algiers share the bill is very exciting, to say the least. The pair of bands exceeded expectations, Atlanta and Edinburgh coming together at Vancouver's Venue Saturday to deliver a storming, ecstatic show. Venue, home to many a club night, isn't known for its amazing sound, but this obstacle fell to the wayside, given the immense power of the musicians onstage. Algiers, the band's members hailing from Atlanta, London and New York, kicked off the night with a short, electrifying set that focused on their acclaimed 2017 record, The Underside of Power. Frontman Franklin James Fisher switched between his vocal pedals and guitar instead of leading piano-driven tracks, which heightened the taut intensity of the band's performance. The group's lengthy touring schedule has ensured their strength as a unit, as they continue to pick up new fans along the way. Venue's mix wasn't ideal, yet Algiers powered through their set with determination. 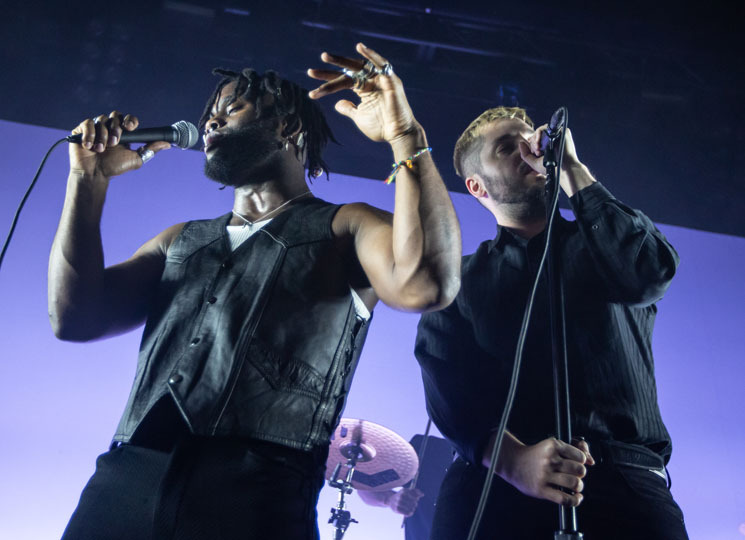 Smoke began to billow and the screen behind Young Fathers' stage setup flashed as the Edinburgh trio's entry was announced, the sold-out crowd eagerly packed into the room. Alloysious Massaquoi, Kayus Bankole and Graham Hastings are unlike just about any other band. Their music transcends genre, insistent rhythms coming up against hooks, interspersed with layers of vocals — their production builds and builds until you think it might break, yet they're able to strip it all down to a beat, a dance move, Alloysious's voice alone — and a sense of unpredictability exists. Touring drummer Steven Morrison pounded along with the group's hyperactive production, with Alloysious drumming at points, Graham attending to a modular synth, and Bankole gloriously kicking at a cymbal. At its heart, the group comprises of three deeply expressive men, microphones in hand, creating work which exists at the intersection of their experiences. Sinister and delivered with conviction, Young Fathers shifted through voices, textures and an unrelenting drive. "Wow" coupled doo-wop backing vocals with guttural cries, the expansive range of the group slowly revealing itself to those unfamiliar. It is a wonder to see the band perform, the complex duties of each member as a vocalist alone executed seamlessly. Kayus's dancing was celebrated by the crowd, as he moved amongst his bandmates, holding hands with Graham back-to-back during a rendition of "Old Rock n Roll." They welcomed audience members' energy, which only served to add additional power to their unrelenting performance. Graham deemed the crowd's response to his call the best of the tour, allowing himself a rare smile, while Alloysious laughed through his verses as the crowd screamed along when Kayus's shirt came off. The throbbing rhythm and organ of "Rain or Shine" kept audience members on their feet, its soaring vocals creating a sense of anticipation. Fans were treated to the live debut of Cocoa Sugar highlight, "Border Girl," its melody creating an opportunity for the band to showcase more stripped-back vocals, heard as well in their performance of "Lord." "Shame" marked an invitation to dance, and concertgoers were indulged with one last track before the show came to an end. The group truly performed to their fullest, clearly enjoying the experience and receiving the energy they sent out into every corner of the room back to them. Last night certified Young Fathers as ever deserving of their accolades, a truly singular force who disregard convention and the notion of genre to create visceral, daring art. It was a privilege to immerse oneself in the group's joyful, unabashed performance, which captivated those in attendance. Concertgoers were able to experience what may very well be one of the group's final club shows as their ascent continues.